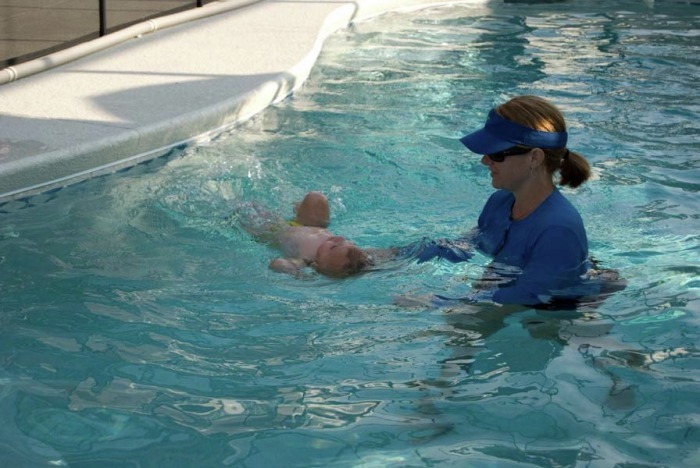 Brym Anderson, ISR Self-Rescue™ Swimming Instructor in Winter Springs Oviedo area. 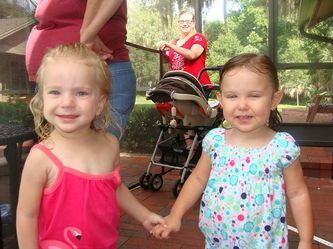 Infant Swimming Resource ISR, located in Winter Springs, FL is honestly the best money I have EVER spent. Shortly after completing my 15 month olds 6 week Infant Swimming Resource course we had an incident in our neighborhood pool. I was standing in front of her while she was playing on the steps and my 3 year old asked me to look at her jump into the pool (because she could swim great!). I took my eyes off my little one for maybe 5 seconds and turned back around to find her floating on her back about 6 feet away from me. She had stepped off the ledge but instantly got to her back because that is how she had been trained. All the time and money in the world is worth your children having that life saving technique. 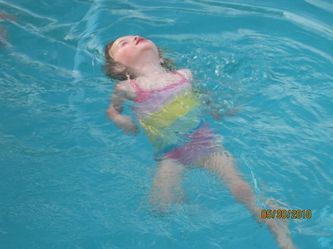 Today my kids are 4 and 6 and are excellent swimmers that still show me they can float before they get to swim freely in the pool. 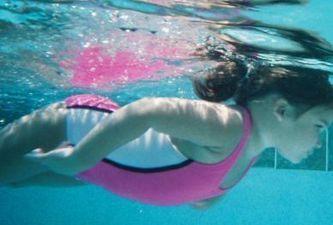 As a pediatrician, I am faced with the devastation of childhood drownings on an all too frequent basis. No one ever thinks it would be their child who drowns but accidents do happen. These lessons are way too important to pass up. Brym Anderson personally swam my children and I could not thank her enough. She is an excellent teacher and my kids love her. I sincerely encourage you to enroll your child in ISR. It could be a matter or life or death. I wanted to take the time to thank you for all of your hard work with Alexis. As you know in the first few days of lessons Alexis was not very happy to be there however she quickly came around and grew to love coming to lessons everyday. I do believe the main reason she loved lessons so much is her instructor. You are very patient and are wonderful with all of the kids. 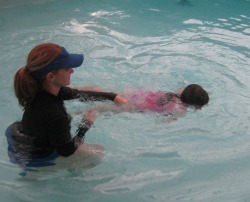 Alexis loves to be in the water and really needed to be taught how to react if an accident ever occurred. I feel 100% confident that Alexis will be able to do this should anything ever happen. I feel much more comfortable having her in our pool on the weekends and I thank you for that. I do think Alexis will really miss her evening ISR lessons and working with you. She talks about her lessons often and I am sure she will be excited to come back next Spring. Thank you once again and we look forward to bringing Alexis back in the Spring for a refresher course. Kara, Mike, and Alexis H.
When I started researching the ISR program I had no idea the rewards this would bring our family. I thought my kids would just be able to swim. But they have learned so much more, confidence, technique, and skill. Not to mention the fun they have while learning. Samantha started last year when she was 1 yr 2 mths, and learned swim, float, swim. Now she is 2yrs 4mths. and after her 2 week refresher course she is a fish! The work you two have done is incredible. She did great with your patience and encouragement. Now, Cooper is here and he started at 9mths, finishing in a mere 3 weeks. Whenever he gets in the pooI the first thing he wants to do is get on his back to float. I am so proud of my kids. 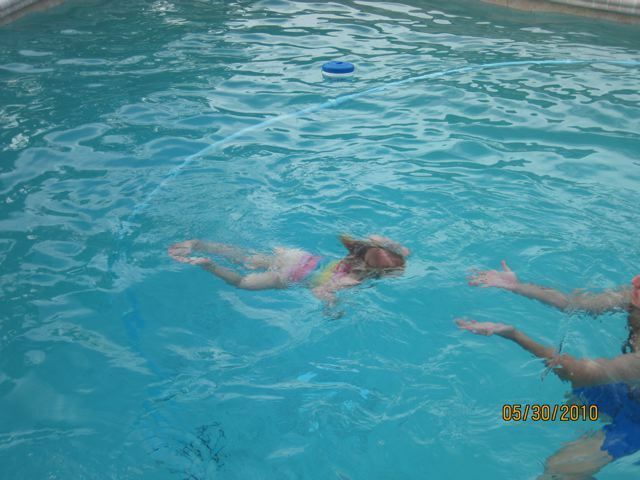 It is amazing how my they have learned how to float and swim. I can't thank you enough for how you have taken care of them and this wonderful program. I am your walking billboard, I tell everyone that has kids about you and ISR. I can’t thank you enough, we truly appreciate all that you do. As a parent, I was a little nervous to start my 4 year old daughter Alexandra in the ISR program. I wasn’t sure what to expect. But I must say this is one of the best decisions my husband and I ever made! In addition to the program being outstanding, we got very lucky with having Brym Anderson as our daughter’s instructor. The first lesson started out with a little bit of crying, but by the third day Alexandra couldn’t wait to go to what we had called “mermaid school.” Brym knew exactly how to work with Alexandra; she was kind, patient, and extremely skilled in utilizing techniques that fit with my daughter’s personality (my girl is a talker!). Alexandra and Ms. Brym had made a wonderful connection. Each day we saw Alexandra progress and learn her swim-float skills faster than we ever expected! Going to swim lessons each night became more than something we had to get done - it was something we all looked forward to doing. And better yet, we have already had an amazing summer filled with fun times swimming in the pool! We recently went on vacation and everyone asked where Alexandra learned how to swim. I happily told them everything about our experience with the ISR program and our wonderful instructor, Brym. My daughter has been done with ISR lessons for a couple of months now and still tells me that she wants to go see Ms. Brym. Although lessons are over, we have fond memories of Ms. Brym and the program as well as an ISR t-shirt that Alexandra got when she signed up for lessons. And I just love the t-shirt! On the back of the shirt it says: “I can swim…just watch me.” And everyone does. First, I wanted to sincerely thank you for the caring and professional manner in which you taught my daughter Brooke survival swimming lessons. 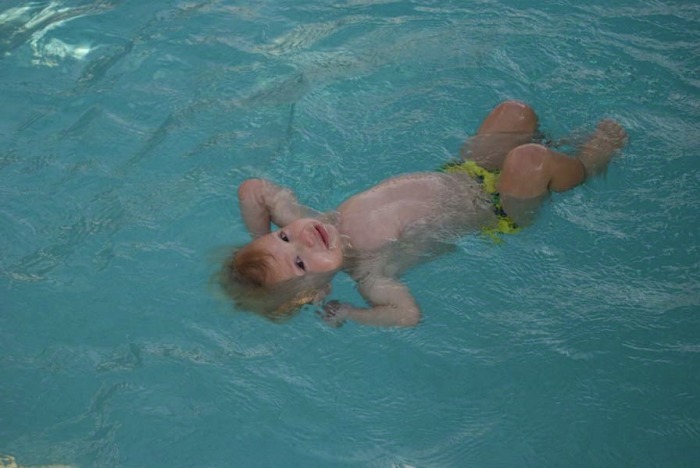 As I shared with you when I was 16 my 2 1/2 year old brother drowned in our family pool. I knew I needed to equip my daughter with the skills of water survival. Those sad memories of my brother reinforced the importance of it, especially living on a lake now myself. 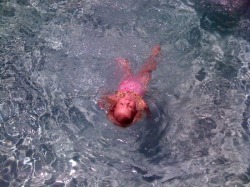 I was scared at even the thought of my daughter in the water without me. This was a very serious and difficult decision for me because I had to have the right person and the best trainer. I looked at many programs locally and spent hours on the internet researching this. Then I found the ISR's website. I looked at all the trainers in the area and narrowed it down to only a few. I read about the trainers personally including reading the testimonials. Yours really impressed me. I bet I sent you 5 or more emails asking questions before we even met and then I asked a million more. You answered them all and took as much time needed to make me feel comfortable not only with you but with the ISR program. I wanted that one on one training program. When I saw you with my daughter, I knew I had made the right choice and my daughter was in the hands of the best. You’re a wonderful trainer but a better person. The combination of those two make you by far the best choice for any parent to entrust their child too. I know every parent wants the best for their child and that is why I felt compelled to write this to you. My hope is others may see this and know you are what they are to looking for. I am confident that my daughter will be alright now. Thank you again for your dedication to my daughters training. I felt like a family member was out there with my daughter. Brym, we'll see you next year for the swim and float lessons. I can't say enough about ISR! It has done so much for my 3 and 5 year old! They each started when they were one year old and have returned each year for their refresher classes. We have been going to Brym's home in Winter Springs, FL for the past two years and she is wonderful!! She has so much patience with the children. She is so kind and gentle and she did everything she could to work with our schedule! I tell everyone that asks how my children learned to swim so good that it was all thanks to Brym Anderson at the Winter Springs ISR. I would also recommend Brym to anyone that I knew was considering lessons. So if you live in Winter Springs, Oviedo, Winter Park, Casselberry or anywhere near Orlando FL area you need to come see Brym. Brym first started ISR with our twins just after their first birthday and then did a refresher with them right when they turned two. They are like little fish now! They both will jump in, swim, turn on their backs, then turn over and swim again. They both will swim to the wall and both step areas of our pool. 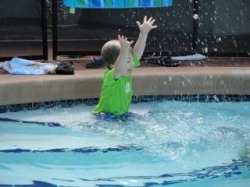 Our little boy can actually jump in and swim across the pool to the wall. It's amazing! They are only 2 yrs and one month old! We highly recommend ISR and Brym. 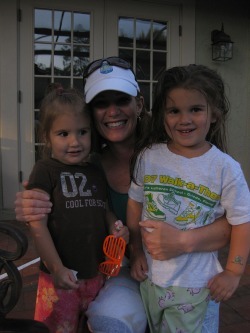 She is so wonderful with the kids and produces amazing results! 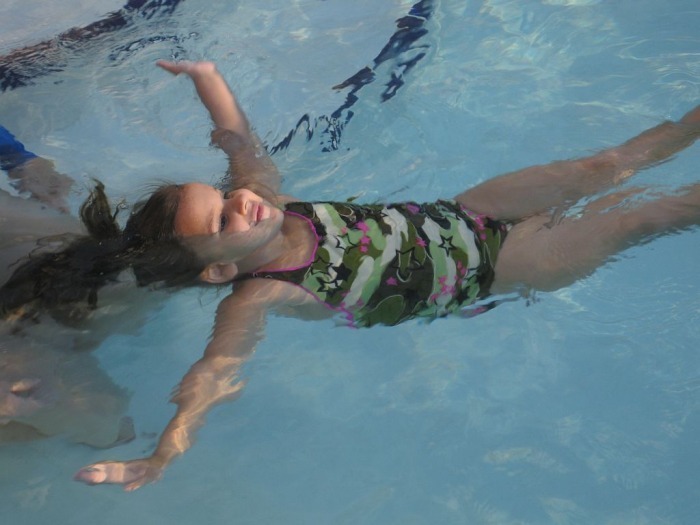 I feel that enrolling my children in Infant Swimming Resource was one of the best decisions we made for our children in regards to their swimming survival skills. 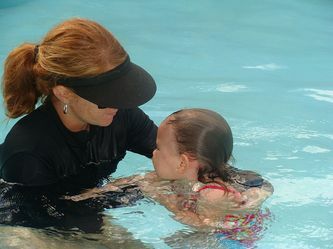 This program gives small children the skills and the confidence to be around water and not be afraid of it. It is comforting to not be the parent who is frantic around a friend's pool or a lake but instead be a cautious, relaxed parent. Brym Anderson was professional and knowledgeable but also very compassionate with my children. You can tell she believes in ISR and has a passion for this program. We can't thank her enough for the skills she instilled in our boys. Julian was very comfortable with Brym and that helped him learn the ISR skills very fast. She made our experience very fun and enjoyable! Brym’s sincerity really shows how much she loves her job! She has a true gift and has shared such a valuable lesson with my family. Thank you ISR and Brym Anderson! Upon enrolling our daughter in ISR lessons, I became so nervous as the first lesson approached. 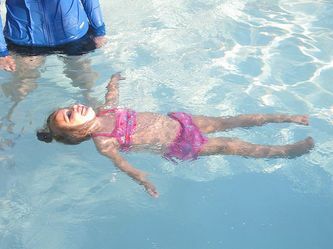 I wondered how my toddler would react to the water, would she be able to learn, what if she screamed the entire time.......Well our instructor Brym was absolutely fantastic. She was so patient and comforting to both my daughter and myself. She was great at showing us how our daughter was progressing and was so encouraging. 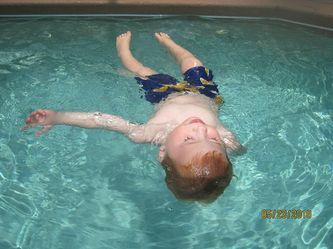 We are so happy with the results and are looking so forward to our Infant Swim lessons again this year. A wonderful and priceless experience. When we built our home in Oviedo, FL we knew in advance that we were going to have a swimming pool. 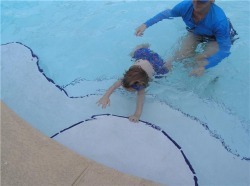 Since we have young children is was imperative that they could be taught to survive an accidental fall into the pool. Thanks to Brym and her amazing ability to make children feel comfortable and confident in the water, my boys love swimming and don't want to get out of the water!!!! Her technique and approach to ISR is beyond what I could have ever expected!! She has truly been in every sense of the word a lifesaver!!! Having a swimming pool in my backyard is a wonderful thing! But, with a toddler in the house, it becomes a constant stress. I have had both of my daughters take ISR lessons and feel confident that if either one of them fell into the pool they would know how to get out. There is nothing more comforting than that! Brym Anderson is a WONDERFUL instructor who is very patient and kind with my children. Her dedication to teaching the children the proper tools of swim survival is absolutely admirable! 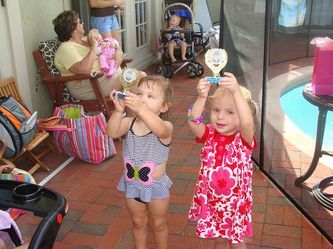 As the mother of twins, with a pool, in a neighborhood surrounded by retention ponds, I knew that ISR Winter Springs was a top priority for my family! When I learned that Brym is a mother of twins too, I also knew she was the instructor for us! Last summer Brym was great with the boys and they learned the very important self rescue techniques that made us more comfortable with our home and neighborhood. We are back in the pool this year and the boys LOVE the water and are eager to swim! We can’t wait to begin their refresher course and get the twins on our boat this year. Brym Anderson is a top notch ISR instructor and the lessons are a necessity for anyone with children living in Florida! Brym, Thank you for your patience and perseverance with Aiden. He started out leery and finished with confidence. He really enjoyed his lessons and misses them already. You have given him a life saving skill that we are very grateful for. We will see you next year for another refresher! Thanks ISR Winter Springs Florida! 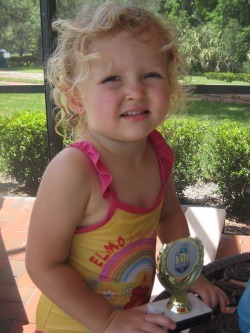 We wanted our daughter Ava, to develop the survival skills needed if ever there were an accident in the water. I researched the various types of programs available and found ISR to be the safest approach to Self-Rescue™ instruction. After even more research we found your web site and were so please that you were located in Winter Springs Florida. Casselberry is just around the corner and judging by all you happy customers we knew you would be a fit for us. Ava began ISR lessons with Brym when she was nine months old. Brym’s approach to ISR combined with her ability to make the children feel comfortable in the pool, makes her an absolutely wonderful instructor. Brym interacts so well with all of the children and gives them the confidence they need to develop these life-saving skills in the water. 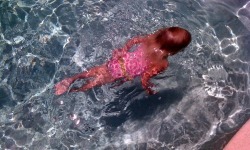 I am amazed to see Ava float on her back now! Brym, we appreciate all of your hard work, patience and dedication to Ava. We can’t thank you enough! We are looking forward to bringing Ava back to continue her lessons as she grows. Thank you for everything! The kids miss you everyday and ask if we are going to Brym's for swim. So cute! Thank you so much again for a great season. 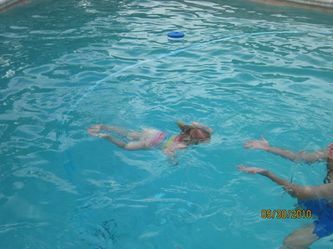 We are having so much fun in the pool at home with the kids. Living in Florida, we knew that we would not be comfortable until Lucas had learned how to handle himself if he should accidentally wind up in the water. This was not going to be an easy task, as he didn’t even like to get his hair wet in the bath! We began looking for an instructor and found Brym on the ISR website. We were very happy to learn that she taught in a salt water pool, as we were concerned about exposing him to too much chlorine at such a young age. At 16 months we scheduled his lessons. 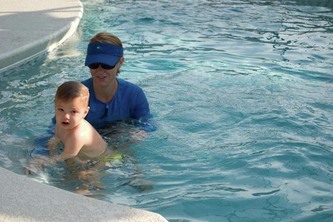 We knew his first few experiences in the pool would be difficult for him, but Brym was able to handle his fears with warmth, patience and gentle encouragement. He quickly learned how to float and breathe on his back, and soon was able to roll into that position from just about any entry, even dressed in long pants and shirt! We were very impressed with his training, and with his instructor! The following year we returned for the next level of training. Lucas was a little bit apprehensive the first lesson or two, but he had not forgotten any skills he had learned the year before and was soon learning new ones. It was then that we noticed an amazing change in him. He actually smiled in the pool, something he had never done before. Each lesson we saw his confidence building. 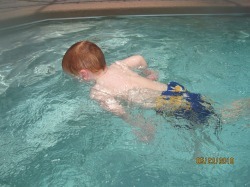 He was soon laughing in the pool, eagerly practicing his new skills. When he successfully completed a maneuver, we could see that he was actually proud of what he had accomplished by the way he would look at us grinning from ear to ear. At home Lucas began to talk about going to Brym’s house, being in the water, climbing out on the stairs and using the bars; he would even tell us which turns to make while driving to lessons! We cannot describe what a joy it was watching him learn these new life-saving skills while learning to enjoy being in the water! Brym is a fantastic instructor, and we give her and the ISR program our highest recommendation!